Australia, Brazil, Canada (including the Trent-Severn Canal), all of the islands throughout the Caribbean, China, Costa Rica, Croatia, England, Ghana, Honduras, Hong Kong, Indonesia, Italy, Japan, Kenya, Korea, Liberia, Malaysia, the Marshall Islands, Mexico, New Caledonia, New Zealand, Nigeria, Panama (including the Panama Canal), Philippines, Saudi Arabia, Seychelles, Spain, Tanzania, Taiwan, Thailand, Turkey, US (East Coast, West Coast, Alaska, Hawaii, Guam, the Rivers, and Great Lakes), Venezuela, and Viet Nam. 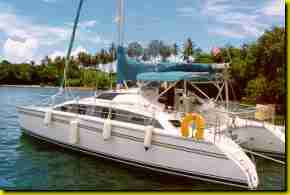 Contact us for a free quote to move your yacht on the water. Our reasonable rates coupled with our college educated Master and crew, lifetime experience and knowledge will provide a guaranteed maximum day and maximum charge for the passage. 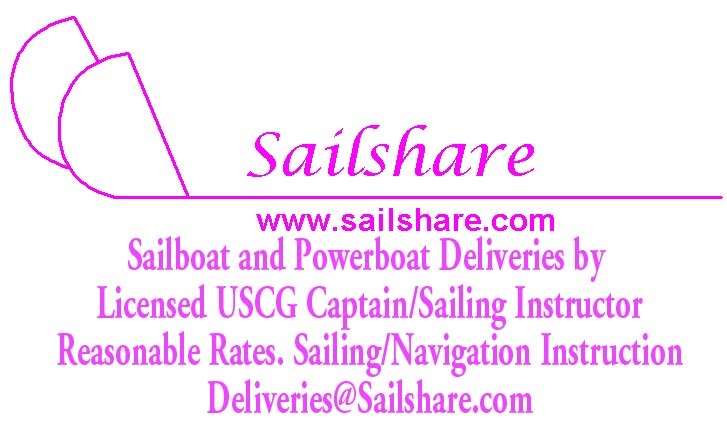 Click Here for More info on the Sailshare Yacht Delivery Webpage. Sailshare has been in business since 1993, so it has over 22 years of experience. We have a dedicated and capable staff which includes a fully licensed marine engineer, USCG certified Captains, marine surveyor, chefs, and several other full-time staff, Sailshare can provide a personal service for your yacht, yourself and your charter guests. For your convenience, Sailshare also has stateside offices in Key West and Fort Lauderdale to help you save on overseas phone calls, deposits, making reservations, and faxes. The Hands On General Manager in Key West is Capt Dennis Gill, who started teaching sailing at the age of 14 in Massachusetts, where he grew up. Capt Dennis has now been sailing for 46 years. Most of our clients are from Canada, the USA, Germany, England, Holland and South and Central America. The mission of Sailshare is to provide years of adventure and experience under sail in the US and in the exotic islands of the Caribbean.We have a certified American Sailing School, Captain Services, and crewed charters available in Fort Lauderdale and the Florida Keys. USCG Documentation Services and Waivers to Jones Act to allow foreign-built vessels to be chartered in US Waters.